A homeless man getting new socks from The Joy of Sox at a clinic run by JeffHOPE medical students in Philly. Why new socks for the homeless? If you were asked what do you do with your old clothes when they wear our, or go out of style, like most people you’d probably say you donate them. But what do you do with your old socks? Mmmm. You probably trash them because they have holes in them. If we were homeless looking for a donation of clothes we’d get jeans, sweaters, shirts, but probably not new socks! So, the vision of The Joy of Sox® is to solve that problem. Their mission statement makes is clear and simple: to provide joy to the homeless by giving them new socks. According to the Mayo Clinic, in cold enough conditions, frostbite can occur in 30 minutes or less! Warm, well-fitting socks can prevent this for many people. Moisture-wicking socks are especially important for those facing the summer heat and humidity. By pulling sweat away from the skin, conditions such as infections and blisters can be prevented. Many bacteria and fungi thrive in warm, moist environments. Access to clean, dry socks can go a long way in avoiding foot infections. Poor circulation puts feet at risk every day. Proper socks can provide a simple, but important layer of protection between these feet and limb threatening conditions. Clean, well-fitting socks are a vital part of keeping feet healthy! The impact is immediate and ongoing! Wearing the right socks for the right activity can go a long way towards foot health. Those struggling with homelessness don’t have that option. But new socks help! Clean and well-fitting socks are just as important as medication or insulin for those that deal with diabetes. Help save limbs by donating new socks. 1 million Americans had Type 2 Diabetes in 2012. (American Diabetes Assoc.) Part of proper Diabetic foot care is access to appropriate sock wear. 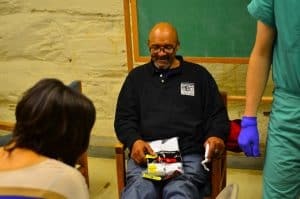 A study out of Samuel Merritt University identifies foot and ankle health as an important public health concern for the homeless. Socks can provide simple, but effective cushioning for painful foot deformities such as bunions and hammertoes. This can make all the difference to someone who needs them! Barefoot walking exposes feet to injury, infection and pain. Limbs can be saved with just a simple, “healthy” pair of socks! Moisturizers for dry skin often penetrate better when socks are worn. Yet another reason why clean, well-fitting socks are so important for foot health! Painful corns and callouses form from pressure and friction on the feet. Cushioned, clean socks are a great first step in preventing or slowing their formation. Sepsis (or blood infection) can start from a simple blister on the foot. Healthy socks keep more than just feet healthy, they can save lives! Athletes foot needs warm, moist areas to grow in. Dry socks provide a less hospitable environment for this uncomfortable condition. Toenail fungus can lead to thickening, deformation and pain in the toenails. Socks help prevent the conditions that best allows fungus to grow. Verruca plantaris (or Plantar Wart) is caused by a virus that enters the skin through sometimes microscopic cracks. Clean, dry socks can help block this virus from ever entering the foot! Who knew how important those new socks, that most of us take for granted, can be? A special thanks to Jennifer J. Spector, DPM, FACFAS – Cafengiu Podiatry and Sports Medicine, Marlton, NJ for providing the some of the important facts about new socks for the homeless.